This gift is perfect for anyone who loves firefighters, and it makes a great parent-kid activity too! 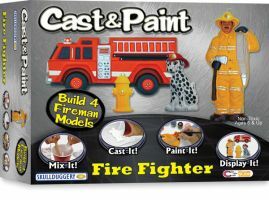 This Cast & Paint kit lets you make four cool fire-fighting models, then give them your own custom paint job. Once they're finished, you can play with them, display them, or even attach the included magnets and put them up on the fridge.